PONZIO durvju sistēmas :: SIA "AMP Sistēmas"
Ponzio comapny is a manufacturer of aluminum systems that are used in the construction of windows, doors, walls, facades, winter gardens, sun visors, as well as specialized solutions of various types, including fire resistant constructions. The innovative system solutions used in various buildings, meet the stringent requirements for energy efficiency, comfort and safety. Systems produced by Ponzio hold the necessary approvals for use in construction. 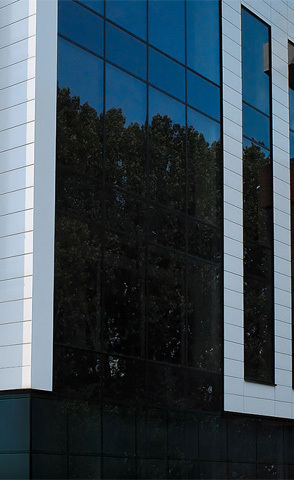 Painting and anodizing lines of Ponzio Group are among the largest in Europe. They hold a Qualicoat quality certificates in the field of powder coating and Qualanod in the field of anodising the profiles. They also protect the natural environment. Ponzio Group exports its products to dozens of countries located on different continents. Buildings designed and constructed using Ponzio systems can be seen in many countries around the world where they create an image of modern architecture. The sum of the experience gained during the 70 years of tradition on global markets and a 25 years of activity on Polish market, locate Ponzio Group among the largest suppliers of aluminum systems in the world. We cooperate with architects, manufacturers and we offer help for individual investors and general contractors. Highly qualified staff is at Your disposal at every stage of cooperation. Starting from the project – serving with technical support, support in the implementation of objects realization, ending with the delivery on time, for which a modern logistics center is responsible. The potential of our company will for sure allow You to joint us and realize many interesting and even the most complex projects. © 2014 - 2019 SIA "AMP Sistēmas"